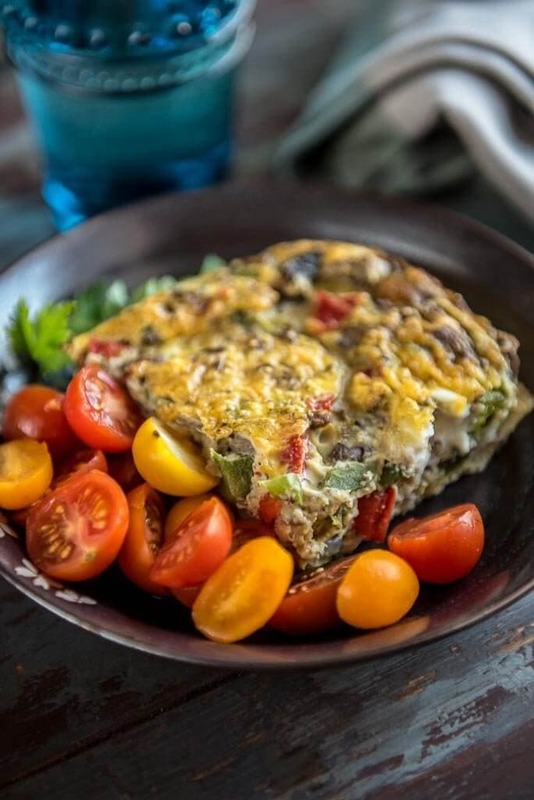 This healthy breakfast casserole is quick and easy to prepare and is loaded with veggies! Is there anything better than starting your day with a delicious breakfast? I love breakfast food. And my favorite thing to have is a breakfast casserole. 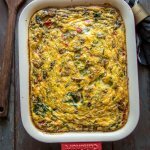 I hadn’t made one in a while and I decided to create my own healthy breakfast casserole with vegetables… and I’m so glad I did. 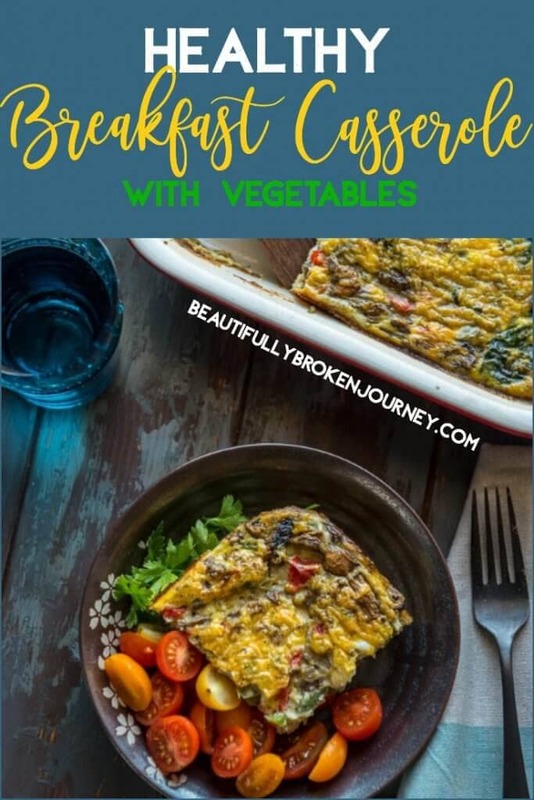 This recipe makes 8 servings and is a great way to start your day packed full of vegetables! I love when I can sneak veggies into a recipe like my Turkey Black Bean Chili with Butternut Squash. This is a great recipe to meal prep as well. I get up early and work out most days, and when I get back home I only have about an hour to get my boys and I ready for the day and my son to school. Some days I’m so busy taking care of them that I forget to make my own breakfast! When I made it last week I was able to eat it for a few days so breakfast was taken care of! It’s also a great idea to prepare the night before and leave it in the fridge so when you wake up the next morning, breakfast is already prepared, you just have to cook it! That’s what I call a MOM WIN! I’ve always loved breakfast casseroles. I love the ones that are loaded with cheese and sausage, but I also enjoy a healthier option such as this one. You are going to love this recipe… and here is why! Take this to your next brunch, or just whip it up this weekend for your family. This is a great casserole to prepare if you are having company over as well! 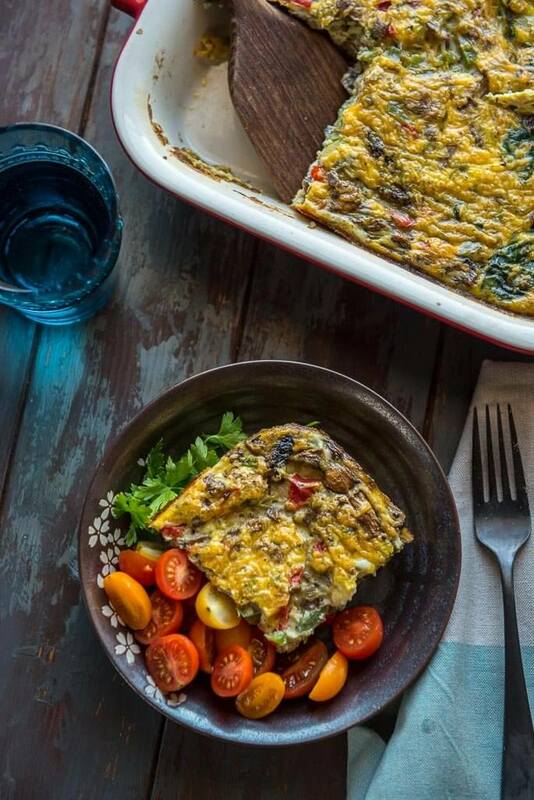 No matter what occasion you make it for, I hope you enjoy it and feel good about filling your body with a nutritious and satisfying healthy breakfast casserole with vegetables. Enjoy! 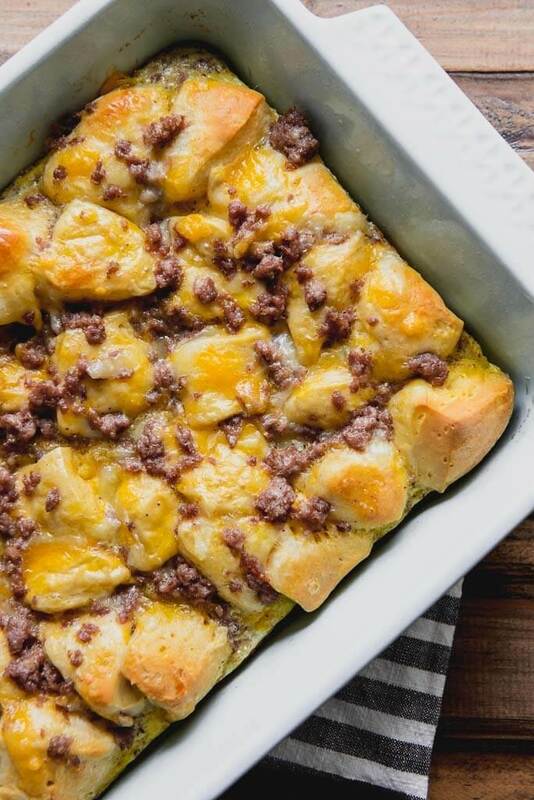 Check out my other popular breakfast recipe, Breakfast Casserole with Biscuits! Preheat oven to 350 degrees. Spray 9x13 pan with cooking spray and set aside. Put olive oil in skillet over medium heat and sauté peppers and mushrooms for 3-4 minutes. Add spinach to skillet and cook until it is wilted. Crack 12 eggs and place into large bowl. Whisk together with milk until smooth. Add cooked vegetables to bowl with eggs and milk. Add salt and pepper and gently mix together. Pour into prepared pan. Sprinkle cheese on top. Cook for 20-25 minutes or until knife comes out clean from center of casserole. This is a great breakfast! And only 1 WW Freestyle point? Wow! Oh wow, this looks so good! 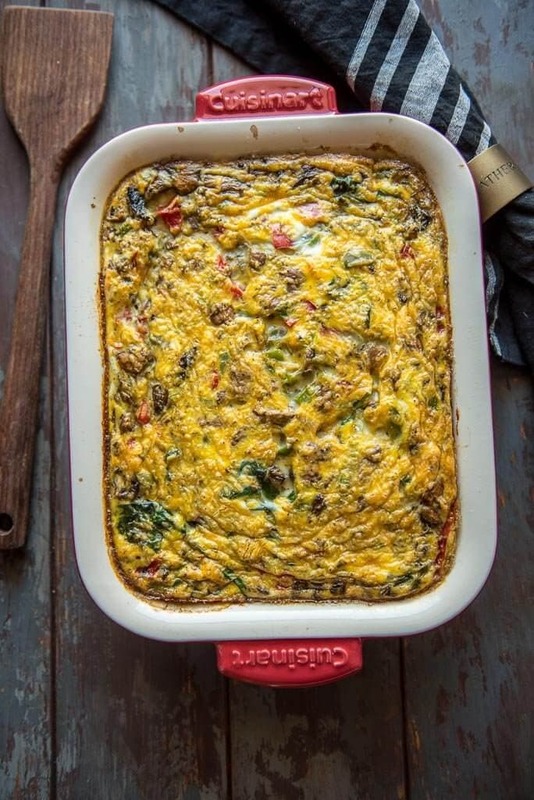 I would never think to make casserole for breakfast, but this looks so good and healthy too. My son would really like it! Going to try it for sure. Thanks so much, Helen! Hope you and your son love it! Thanks Kim!! I love them too! Sounds perfect for a weekend or when you have people over. Love the pictures. It is great for a crowd! Thanks! This actually seems pretty easy to make! My 1 year old would love this! Super easy to make!! I hope your baby does love it! This is fantastic. I love a delish and healthy breakfast, and this year I am working on not skipping breakfast anymore so I dont end up snacking during the day. Good plan to not skip breakfast! Hope you try this and love it! Amy since you have already figured out the points could you plug in 1 cup cheese & see how much that changes the points? Thank you. I’m going to make this tonight and add some leftover ham from Easter. I can’t wait!! Thank you! I hope you enjoy it, Jill! Is it possible to make the day before you want to serve it? Yes, it reheats well. Though I will say it will be the best if you serve it right away.